The Cambiano's design avoids decorations and uses as few lines as possible. TURIN -- Pininfarina has released images of its plug-in hybrid coupe concept ahead of its debut at the Geneva auto show on March 6. The diesel plug-in hybrid is inspired by the 1957 Lancia Florida II, the first concept car built by the Italian company and is the first public work of Pininfarina's new chief creative officer, Fabio Filippini, who joined the company in April 2011 from Renault. "We took inspiration from the 1957 Lancia Florida II, trying to create a pure form with a strong impact, which is Pininfarina's DNA. I wanted to create a strong visual impact into the Cambiano using as few lines as possible, while avoiding any decoration," Filippini said. The sporty four-seat concept car has a single long door on the driver's side and two doors on the passenger side. 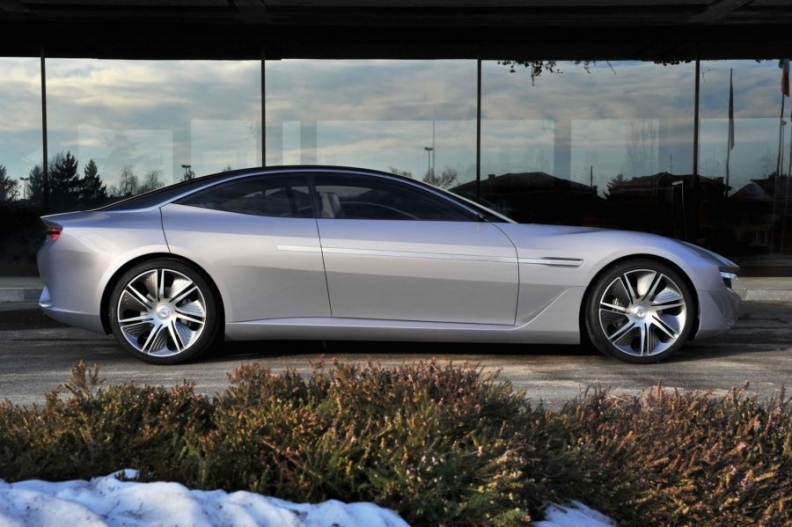 The sleek four-seat sports car concept has a single long door on the driver's side and two doors on the passenger side, including a rear-hinged rear door. It has no B-pillar. To simplify the design of the Cambiano, Filippini created headlights that are tiny LED blades integrated into the grille shape. The rear lamps are hidden behind a gray bar and they reflect light on the car body. Parts of the interior including the floor, fascia and lower part of the door panels are covered with recycled Venetian oak. The car's rear lamps are tucked behind a gray bar and reflect light on the car body. 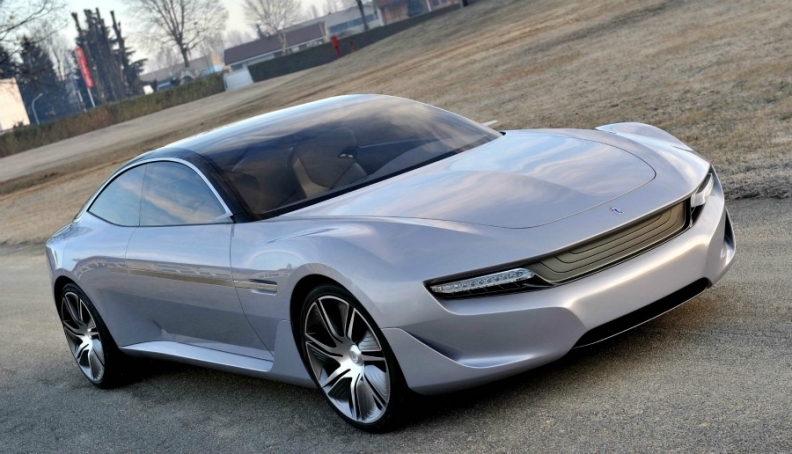 Pininfarina is using a small diesel-fueled turbine as a range extender for the Cambiano concept. 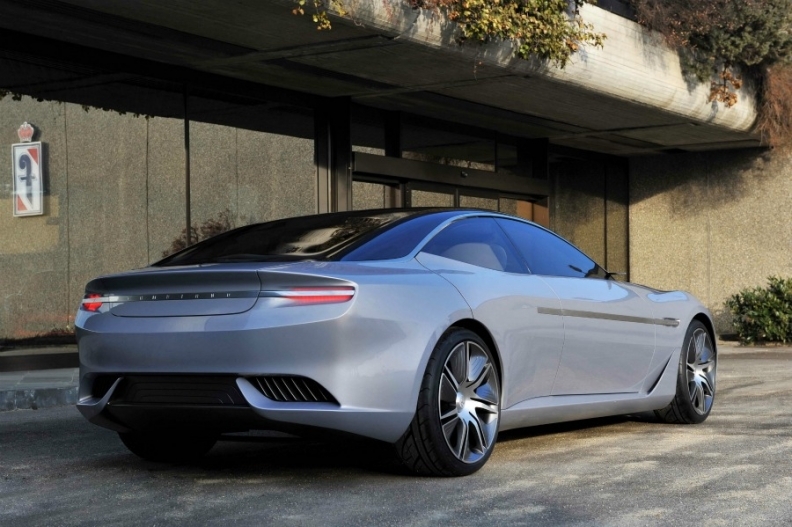 The turbine weighs half as much as an internal combustion engine delivering an equivalent 50kW/68hp power, which can drive the wheels or recharge the battery, Andrea Maria Benedetto, Pininfarina's head of product and process development said. "We decided to use diesel for the turbine because its emissions are so clean that we could consider it a future Euro 7 compliant powertrain," Benedetto added. Benedetto, a former Fiat and Toyota Europe product engineer, said turbines are not suitable to power a passenger car entirely, but work well in connection with an electricity generator. Turbines takes time to reach the required revving level, longer than modern turbo lag. Used to recharge a battery at constant revving speed, turbines are employed at their maximum efficiency. As the turbine needs ventilation only when active, the Cambiano's front grille remains closed most of the time, making the car nose cleaner and the drag coefficient better when driving in electric mode. When needed, three winglets in the grille open to provide air to the turbine. The Cambiano has an electric motor for each wheel, each delivering 60kW that peaks at 150kW for short periods. Maximum output is limited by the battery capacity to 500kW, equivalent to 680hp. Thanks to four individual motors, the car does not need an electronic stability program, because optimal stability is assured by the torque vectoring control of each wheel. The drivetrain setup offers supercar performance with CO2 emissions of just 45 grams per kilometer.